In this 153rd episode, Mike chats with radio personality and television host Stu Jeffries about Good Rockin' Tonight, Switchback, Acting Crazy, his work with Colleen Rusholme at Country 95.3 and EZ Rock and his very cool story of rebirth at Boom. This episode is exactly 1:15:46. 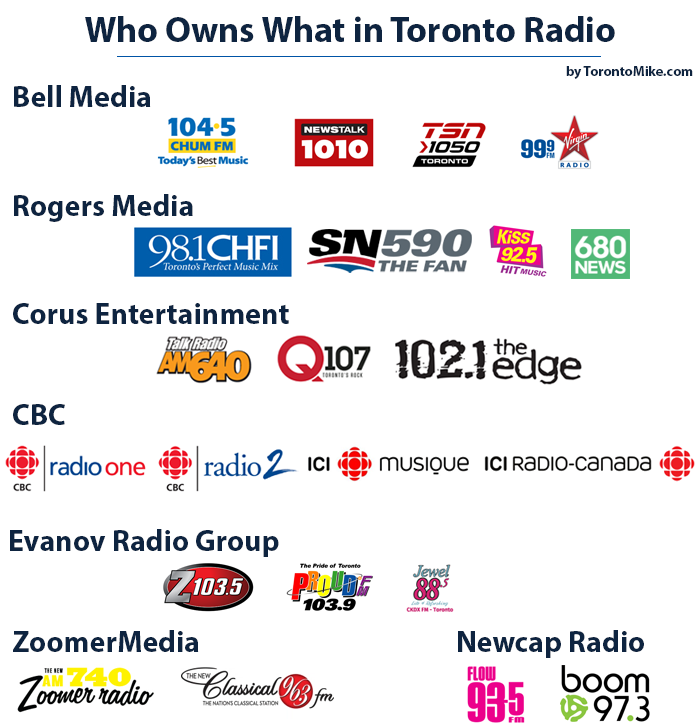 The recent bad news from Bell Media likely had you wondering which stations they own in Toronto. You're forgiven if you're not up to speed with who owns what in Toronto. Here's a handy chart I just put together which I believe includes the vast majority of companies that own multiple stations in Toronto. And yes, I realize the CBC belongs to all of us. We're learning now who has been cut as part of Bell Media's restructuring. The vast majority of those let go were behind the scenes, but I'm going to focus on those in front of the microphone and/or camera, known to those tuning in from Toronto. I'll update this entry as I learn more. CHFI's Facebook page has declared that they're now playing nothing but Christmas music. Here's the official announcement. "98.1 CHFI is now Toronto's Christmas Music Station! We're playing 100% All Christmas Music all the way to Boxing Day! 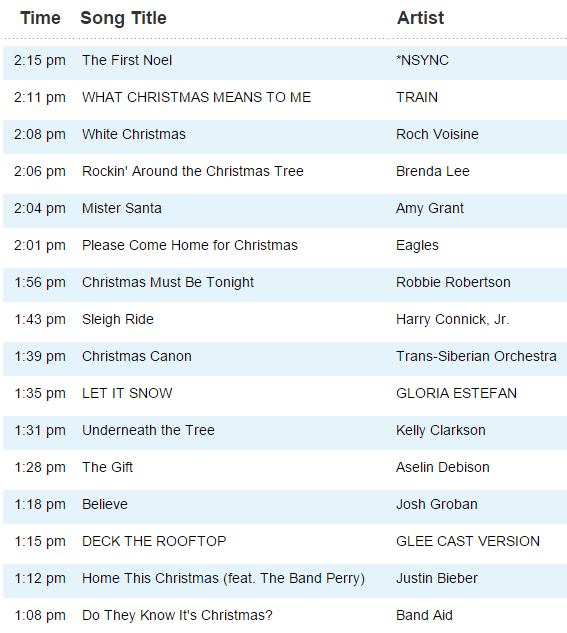 It's November 15, so that means they're playing nothing but Christmas music for the next six weeks. Here's a glance at what they've just played. Is it too early? Absolutely! Personally, I think December 15 would be a fine time for a stunt like this, but not a minute earlier. Is this a dumb move by CHFI? Absolutely not! For some reason, this stunt works, or they wouldn't pull it year after year. I'm sure other stations will follow suit. In this 141st episode, Mike chats with former Fan 590 program director Nelson Millman about his years at the station, the on-air talent, the lack of females on the sports radio roster, competition from TSN Radio and what he thinks of recent changes at 590. This episode is exactly 1:15:57. Pure Speculation: Is There Collusion Between Sportsnet 590 The Fan and TSN Radio 1050? I'm going to preface this entry by saying there's no smoking gun here. Everything you read is pure speculation on my part, based solely on observations I've made as a fan of sports and sports radio. In 2002, Rogers Media, a division of Rogers Communications, purchased CJCL, better known as The Fan 590. In 2011, Bell Canada's TSN Radio 1050 debuted. In response to that, "The Fan 590" was re-branded "Sportsnet 590 The Fan." Since 2011, Bell and Rogers have been going head-to-head in sports media, both on television and on the radio. Bell has their stable of TSN analysts and personalities, and Rogers has their stable of Sportsnet analysts and personalities. Earlier today, I was reading a write-up on Toronto Sports Media. I was curious whether my pals there would mention my recent podcast episodes with David Alter, Roger Lajoie and Eric Smith (they didn't), but took note of a couple of suggestions made by Mike in Boston. Mike suggested that Rogers "poach Bruce Arthur from TSN1050" as a co-host for Bob McCown. Then, later in the same article, he suggests Bell "think about poaching one or both of Brady & Walker." The moment I read those two reasonable thoughts I laughed to myself. As if! You see, I've long suspected there's collusion between The Fan 590 and TSN 1050. Nothing official, nothing in writing, just an unspoken agreement not to poach each other's talent. This would keep salaries down, of course, an ever important part of running a successful radio station. I suspect collusion primarily because we haven't seen any poaching or movement from one company to the other since the sports radio war began almost five years ago. Can you think of an example since Rogers wrestled Damien Cox away from TSN in January of 2011, before TSN Radio even launched? If there are examples and I've simply missed them or forgotten them, please enlighten me in the comments. Again, I present no evidence to support my hypothesis, it's all conjectural, but I do find it rather curious. You'd think 1050 would poach talent from 590 at least once since 2011, especially considering the ratings struggles over there.